By the author of award-winning ‘Blue Smoke: The Lost Dawn Of New Zealand Popular Music 1918-1964. We’ll never forget our boys. Be it ‘Tipperary’ or ‘Pokarekare’, the morning reveille or the bugle’s last post, concert parties at the front or patriotic songs at home, music was central to New Zealand’s experience of the First World War. 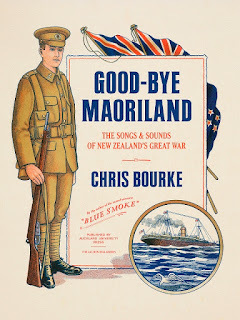 In Good-Bye Maoriland, acclaimed author Chris Bourke introduces us the songs and sounds of the war in order to take us deep inside the human experience. Chris Bourke is a writer, journalist, editor and radio producer. He has been arts and books editor at the NZ Listener, editor of Rip It Up and Real Groove, and producer of Radio New Zealand’s Saturday Morning with Kim Hill. He wrote the best-selling, definitive biography of Crowded House, Something So Strong (1997) and Blue Smoke: The Lost Dawn of New Zealand Popular Music, 1918-1964 (AUP, 2010). At the 2011 New Zealand Post Book Awards Blue Smoke won the People’s Choice Award, the General Nonfiction Award and the Book of the Year Award. Chris Bourke received the Lilburn Research Fellowship for 2015, enabling the writing of Good-bye Maoriland, and is currently content director at Audioculture: The Noisy Library of New Zealand Music (www.audioculture.co.nz).Chris Bourke is currently content director at Audioculture: The Noisy Library of New Zealand Music (www.audioculture.co.nz). Chris Bourke's new book launches this Sunday at Devonport!